This party game is hysterical to watch, and brilliant to be part of! It's cool for a sleepovers, Christmas, Thanksgiving and for family events. - wrapped bar of chocolate on plate. Players sit in a circle with the items in middle. Each player throws a dice in turn, going clockwise. 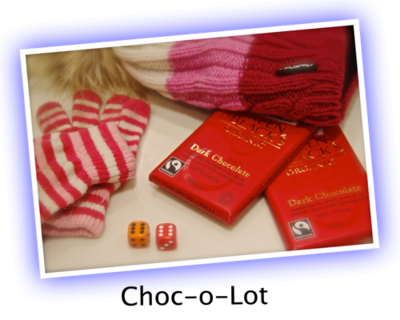 On throwing a six, the player goes to the middle and puts on clothing, picks up knife and fork and attempts to open the chocolate bar and eat the chocolate. Meanwhile the dice continues to go round the other players until another six is thrown. That player takes over from the player already attempting to eat the chocolate bar. A real blast, and an absolute riot if the sixes come in quick succession. Have a camera ready! Very cute game, kids can be super competitive so it keeps them trying and keeps the game going. Ive played it before at my party and it's a great hit!But make sure none of the girls/boys are allergic to chocolate otherwise this game is not a good idea! ill play it at my party. sounds funnnnny!!! I laughed out loud when I read this. lol. lol. lol. lol. That sounds...interesting. Maybe I'll try it...some day. But...my birthday is really tomarrow. My friends and I play this all the time at parties but we call it "The Chocolate Game"
Great fun and everyone loves chocolate! Need to be aware of hygiene these days, suggest cut up with knife and fork and allow them to pick piece up and eat it. i have seen better. but ill try this. Yeah, i play that all the time. We just call it "The Chocolate Game"
I really don't getthe point of the game!